Kansas' Dedric Lawson puts up a jumper. @KUHoops. Kansas, the second-ranked team in the country, beat Marquette, while Tennessee dispatched Louisville in the NIT semifinals on Wednesday night at Barclays Center. Kansas opened the game with a 22-17, but Marquette stormed back with an 8-1 run that stretched into one in which they took a 12-point lead, 42-30, on a Joseph Chartouny three-pointer with 2:20 left in the first half. Marquette took a 47-38 lead into halftime. In the second half, Kansas went on a 22-0 run capped by a Lagerald Vick layup at the 11:00 mark. Marquette's first points of the second half came on a Sam Hauser three-pointer at the 10:44 mark, followed by a Joey Hauser three, but Kansas maintained a 10- to 12-point lead for the rest of the night. 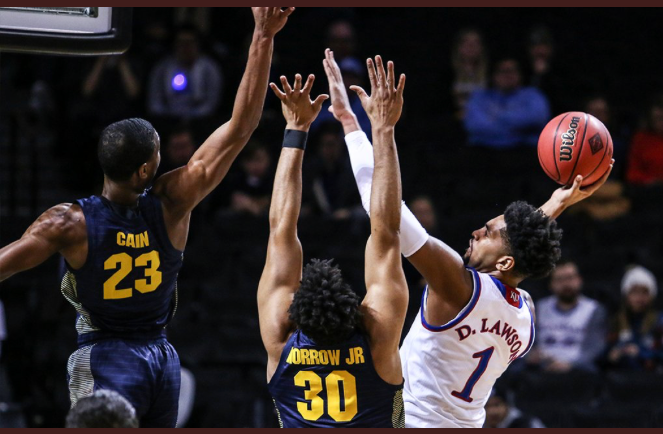 Dedric Lawson led the way for Kansas as he had 26 points on 9-16 from the field, including a three-pointer, with 12 rebounds to give him a double-double, and 3 assists. Kansas Head Coach Bill Self said of Lawson's performance, "I thought his balance was better, the last couple of weeks he was off-balance so tonight he was much more decisive and balanced. He got 26 and I thought he still left a couple out there." Lawson said of his game, "I was just aggressive. It's always about seeing one go in, then it all seems to click. I was freer in my mind." Lagerald Vick had 16 points (6-12 FG, 3-5 three-pointers) and 2 rebounds. Marcus Garrett had 11 points off the bench, along with 3 rebounds. Louisville led this one in the early stages, but Tennesse went on a 10-3 run in the final minutes of the first half to open up a 36-33 lead and they took a 45-40 lead into halftime. The second half was a back-and-forth battle, and the game was tied at 68 with 9:28 remaining. Tennessee responded with a game-winning 17-2 run capped by an Admiral Schofield jumper that made it 85-70 with 5:18 remaining. Grant Williams led Tennessee with 24 points on 9-15 from the field, with 9 rebounds (just missing a double-double) and 4 assists. Admiral Schofield had 20 points on 7-15 shooting, including 4-8 from behind the arc, with 6 rebounds and 4 assists. Lamonte Turner had 13 points off the bench, as he shot 4-10 overall (3-8 on threes), with 5 rebounds and 4 assists. John Fulkerson (4-4 FG) and Joran Bone (4-11 FG, 1-4 on threes) had 11 points each. Louisville was led by Jordan Nwora, who poured in 23 points off the bench on 8-15 from the field, including 3-9 on three-pointers, with 10 rebounds to give him a double-double. FRIDAY NIGHT: Louisville will face off with Marquette in the consolation game at 7 pm, followed by Kansas and Tennesee in the championship game around 9:30 pm.